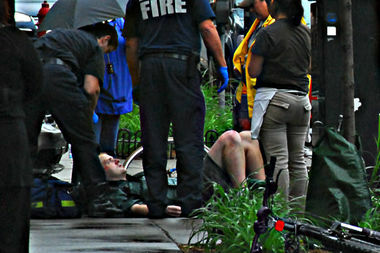 A man is treated after a bicycle accident. CHICAGO — Large trucks working on big projects for the city would have to have side guards installed to prevent pedestrians and bicyclists from being run over by the truck’s rear wheels under a measure backed by Mayor Rahm Emanuel. Trucks weighing more than 10,000 pounds working on projects worth more than $2 million would have to start installing side guards and convex mirrors in January and finish within three years, Emanuel announced. "Chicago is using a data-driven approach to improve traffic safety, and the data shows we can save lives and prevent serious injuries by installing this type of safety equipment," Emanuel said in a statement that noted that after officials in the United Kingdom required the guards, the number of pedestrians killed in side-impact collisions with trucks dropped 20 percent while the number of fatal bicycle accidents dropped 61 percent. Chicago Department of Transportation Commissioner Rebekah Scheinfeld said the safety measures would lower the risk of crashes and make the impact of the crashes that do occur less severe. "Side guards greatly mitigate the severity of side impact crashes, especially those involving pedestrians and bicycles," Scheinfeld said. "And convex and crossover mirrors reduce blind spots for large vehicles." The measure, which is expected to be considered by the City Council next month, will also direct Fleet and Facilities Management Commissioner David Reynolds to begin installing the safety measures on city trucks. In September, the Active Transportation Alliance told city officials there was "an urgent need to address the disproportionate threat these large vehicles pose to people biking and walking" after six bicyclists died after being struck by commercial vehicles. Kyle Whitehead, the alliance's government relations director, said Thursday he was pleased with the ordinance, although it won't fully be in place until January 2021. "Changes like these tend to take longer than anyone would like," Whitehead said, adding that the group would continue to work with city officials to encourage private firms to install the guards and convex mirrors. City officials have vowed to eliminate death and serious injuries from traffic crashes by 2026 as part of the mayor's Vision Zero campaign. Dee Palagi, 27, said she was relieved the city will require its trucks to have side guards — even though that wouldn't have prevented her from suffering serious injuries when she was struck by a semi-truck while riding her bicycle near Roosevelt Road and Wood Street in September 2016. Palagi, whose leg was amputated after her foot was pinned under the truck, said she hoped that the effort would prevent others from being injured or killed. "This should have already been in place," Palagi said. "But it is a good thing moving forward."